1) How did water form on Earth? Liquid water is necessary for all life, at least as we know it, to exist, and its presence on our planet is what makes it possible for everything from the simplest bacteria to the largest elephant to live. Scientists are still divided on just how water came about on Earth, though one of the leading theories is that it was first brought by comets which barraged Earth during the early, more chaotic years of the solar system. While scientists know that comets contain water in the form of ice, the difficulty is in discovering whether the water found in comets is the same water that is on earth. The trick is in measuring 67P/Churyumov-Gerasimenko’s deuterium to hydrogen ratio. Deuterium is an isotope of hydrogen, meaning that it basically just a heavier version. It is possible to measure how often the deuterium replaces one of the hydrogen atoms in a molecule of water. This ratio can vary from object to object in the solar system, depending on the object’s origins and when and where the water on it formed. Should Rosetta’s comet have a similar deuterium/hydrogen ratio to that of Earth’s water, this will make a very strong case for comets contributing at least in some way to the formation of water on Earth. 2) Where do the building blocks of life come from? Life doesn’t just come spontaneously- it requires certain basic “building blocks” to form, such as nucleic and amino acids. Like Earth’s water, scientists are still debating on how amino acids came about. Comets are known to carry a variety of complex organic molecules that are known to be the building blocks of nucleic and amino acids. It’s possible that comets like 67P/Churyumov-Gerasimenko “seeded” either organic compounds or even more complex amino and nucleic acids on earth, in doing so allowing life to form. It’s unlikely that we will find definite evidence of nucleic and amino acids in Rosetta’s comet, but instruments on board Rosetta, along with it’s lander, Philae, could help scientists learn more about just what the nature of the organic compounds within comets are like- and whether they could potentially have been the building blocks that lead to the formation of life’s most basic components. 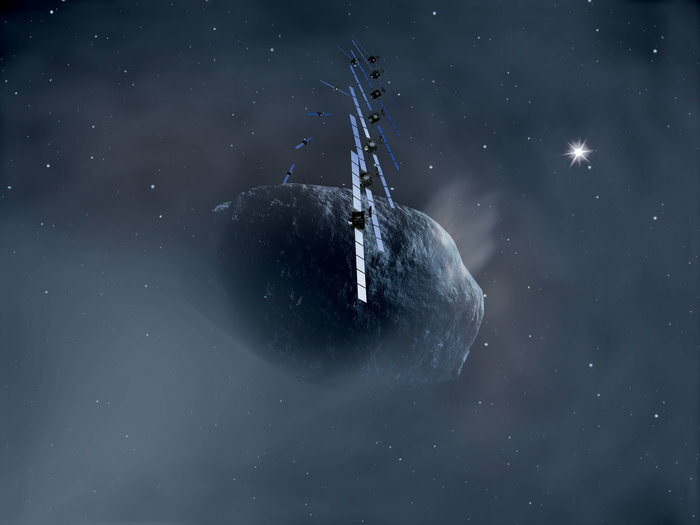 3) Do comets come from our solar system, or somewhere else? While it may seem like just a simple curiosity to know how old 67P/Churyumov-Gerasimenko is, to many scientists, discovering the age of Rosetta’s comet has the potential to unleash a treasure trove of new questions and possibilities surrounding life and its origins not only on Earth but in the universe as a whole. Our solar system was formed some 5 billion years ago, but our galaxy is billions of years older. Should 67P/Churyumov-Gerasimenko prove to be older than 5 billion years, it means that it, and possibly many other comets, didn’t form in the early years of our solar system, but was instead came from another part of the universe and later became trapped in our sun’s gravitational pull. What’s exciting about this is if evidence of nucleic acids or amino acids are indeed found in Rosetta’s comet. Should both these building blocks be found and the comet’s age be found to be older than 5 billion years, it means that life could be much more prevalent in the universe than we thought. It’s possible that comets like 67P/Churyumov-Gerasimenko didn’t just seed our planet with life, but also planets across the cosmos. While it’s a very long shot that Rosetta will give us answers to all three of these questions, or even definitive answers on even one, the fact that Rosetta has the opportunity to shed at least some light on the origins of life is exciting. For now, we can only wait, and see what news Rosetta gives us from 67P/Churyumov-Gerasimenko in the coming months.